In the world today information is power and most importantly profit. People use unconventional means to acquire secret information and then use this information for self gain. One of the main methods of collecting such information is through secret spy listening bugs planted in offices and even around homes. These are usually very small in size and hence hard to detect with the naked eye. 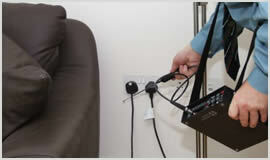 Leicester Private Detectives have high tech equipment for use in a bug detector sweep aimed at discovering all the active listening bugs around the home and office and therefore leave you safe and secure to transact and discuss your business.